Overhead-touch push-ups require the athlete to perform a hand-release push-up (aka: press-up), where when the chest is on the ground and hands are released from the floor, athlete must touch both hands together behind the head. With hands back on the floor, push up with arms fully extended and core tight to complete one rep.
Add a video for "Martin Bell"
This Scottish Hero WOD was designed by a member of CrossFit Airdrie (Airdrie Alberta), Scott James Meenagh, who survived battle as a result of Private Martin's unbelievable bravery. 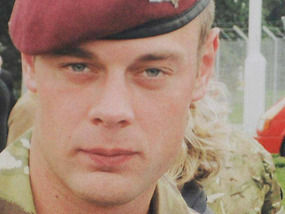 Private Martin Bell was killed on January 25, 2011, whilst serving with the 2nd battalion, the parachute regiment on operations in Helmand Province, Afghanistan. He was fatally wounded when he stepped on an improvised explosive device while extracting Box no. 1 member Scott Meenagh on a stretcher. "He had already risked his own life to get to Scott and to help him deal with his own catastrophic injuries, and in doing so surely saved his life." For his actions that day, Martin received the George Medal for bravery but paid the ultimate sacrifice. Scott has been able to come home and love his life thanks to Private Bell's bravery. We first found this workout via a Facebook post by Clair Moffatt (re-posted by CrossFit Airdrie (Airdrie, UK)) in January, 2018.